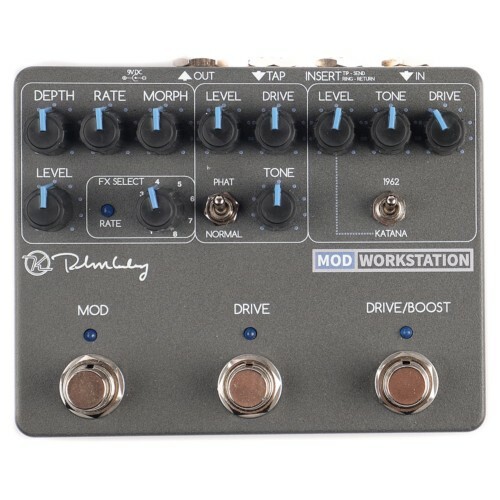 The Keeley Mod Workstation gives you two of the most popular overdrives, the 1962/Katana and the Oxblood along with a set of eight modulation effects, including Harmonic Tremolo, Phase, Chorus, Flanger, Rotary Speaker, and more. 1 Tremolo - Standard volume or amplitude modulation, the tremolo in which the Tone Control is the shape of the waveform. The oscillator goes from triangle to square wave. 2 Harmonic Tremolo – Legendary tone from Brown Face amplifiers in the 1960s. Your guitar’s tone is cut into two bands–bass and treble–and then modulated with a pair low frequency oscillators (LFOs) that are out of phase with each other. When these bass and treble bands are modulated by oscillators that are out of step with each other, the result is very intoxicating. The Tone Control simultaneously moves the Low and High Pass filters, giving you the perfect vibe for your rig. 3 Oscillating and Random Filter – Tone Control adjusts LFO in oscillating envelope filter. It’s like blending a vibe and autowah! If you turn the Tone Control above noon it becomes a random sample & hold filter like the old Maestro units. 5 ADT – the Keeley true-chorus Automatic Double Tracker. Depth Control adjusts the delay time from 0-60 milliseconds. The Rate Control adjusts the tuning 0-60 cents. The Tone Control is a blend control to add more of the doubled voice as needed. Dual Overdrive, 8 Modulation Effects, Tap Tempo, Effect Insert. Includes Chorus, Flange, Rotary, Harmonic Tremolo, Phaser, Random Filter and Hold.